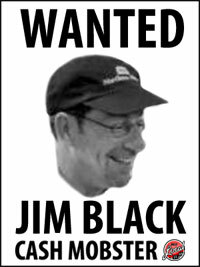 No sooner had the words left my lips that my phone was buzzing with my business partner asking me if I had seen the story of Jim Black in Chagrin Falls, OH. I hadn’t… If you hadn’t either, let me give you the run down. 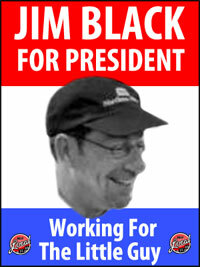 Meet Jim Black. He’s a normal guy like you and I. He lives in his community. He works in his community. He has family and friends in his community. And, most of all – he cares about his community’s well being – the good people (and businesses) that make Chagrin Falls such a great place to call home. (It’s on the the outskirts of Cleveland, OH). Every town has iconic businesses that everybody just knows, just “there” as part of the ethos of the community. As a result, sometimes these businesses silently become part of the scenery – like the river that passes through town, or a bench in the town square. Unfortunately, people have a tendency to forget about things that aren’t the newest, shiniest, loudest – taking the “old” for granted. Chagrin Hardware is just one of these places, a well respected business that has been in town since 1857, and owned by the same family for last 72 years – a staple in the community, but is no stranger to the challenges that face small businesses today. Local businesses often fall into the trap of waning popularity (and revenue) as new people move to town, new competition arrives, and new marketing pushes consumers toward other options. It’s just part of the reality that every local business owner understands and struggles with on a daily basis. For owners Schwind and Steve Shutts, this in not news to them – it’s part of the daily struggle of keeping doors open, paying staff, and keeping inventory on the shelves. It was like Christmas at a toy store. By early morning, Chagrin Hardware was packed full of smiling, supportive shoppers! From regular locals there to support their long-time friends, to strangers coming from out of state. The phones were even ringing with people wanting to know what the store could ship to them! Now, imagine the bell starts ringing faster and faster throughout the day as an entire community appears in support. Instead of sending a “flash mob” to bring joy through singing and dancing, Jim Black unleashed a cash mob, full of supporters saying, “Hey, guys – it’s gonna be okay. Sometimes we just forget to say thanks, but we love you! We’re here for you, too!” And, they didn’t need some predatory “incentive” from Groupon (where 75%+ of the sticker price doesn’t end up in the register) – they put their money where there mouth was. $20 at a time. Imagining this scene chokes me up a little bit… It’s why we started RelyLocal, and these are the stories that I love to hear every day. And, if you want to see how shifting just $10 of your existing monthly spending can make a HUGE impact in your community, check out our Occupy Main Street Calculator. So, I guess the point of this post is partly to say “thanks” to Jim Black. But, also to tell our partners just how honored we are to be working with them all. Well done, friends – well done! P.S. If you are interested in joining the RelyLocal family, check here to learn more about launching a RelyLocal campaign in your area. We are currently looking for about 600 more partners across the U.S., and we’d love to hear from you!